This past November, while David and I were out birding with Susan and Bob Steele, we got to talking about county Big Years. The excitement, the rush, the disappointment, the car miles adding up. This conversation struck a chord in me, and a tiny voice whispered, “It’s been long enough. You could do another one”. The idea of a La Paz County Big Year in 2014 struck me, and I more or less decided right then to go for it. Those who have been following this blog for a while might remember my first county Big Year, Mohave County in 2011. That was a challenge for a number of reasons: it’s the 5th largest county in the country and probably the only one requiring a drive through three other states to get to the other half (thank you Grand Canyon). Not many birders live there. Mohave also has a great diversity of habitats, even three different deserts, and a few high mountain ranges, grasslands, four large reservoirs. That year turned out very well, I think. I got to know my new home county, found a bunch of county birds, and ended the year with 310 species. La Paz is very different. 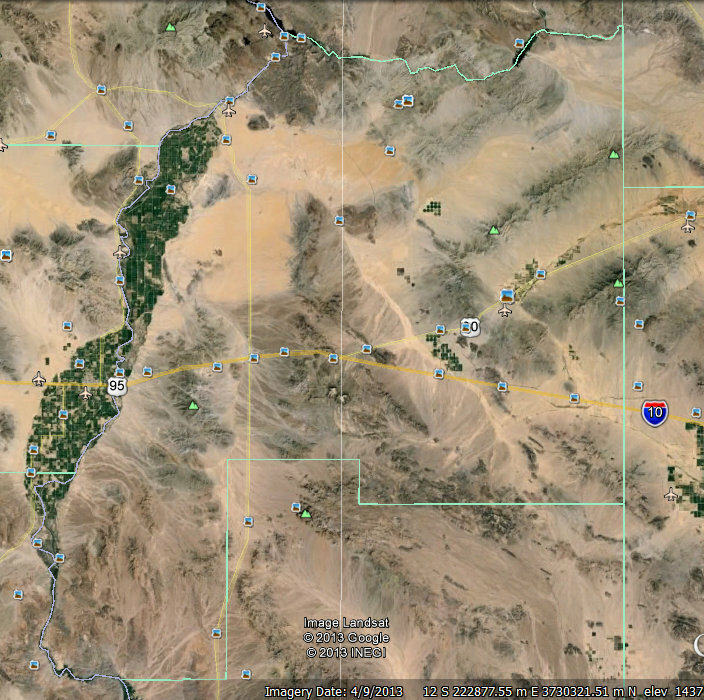 It’s less than half the size of Mohave, with only desert mountains to break up the geography. No pine forest; but a little bit of juniper in the Harquahalas. 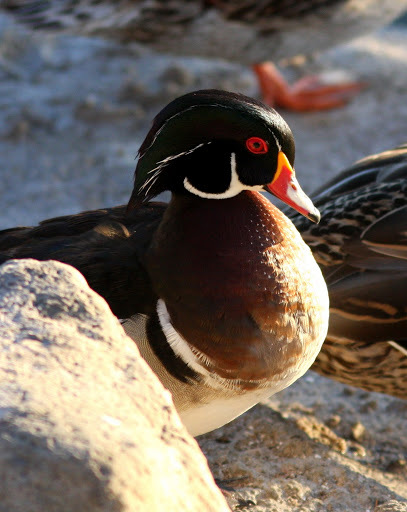 The main feature for birders is the Colorado River, with a few lakes (southern Alamo, the southern end of Havasu, and Moovalya in Parker, and a few small ones; plus small natural lakes only accessible by boat). Half of the Bill Williams, Cibola NWR, and CRIT lands (‘Ahakhav and the Parker Valley) are in La Paz. 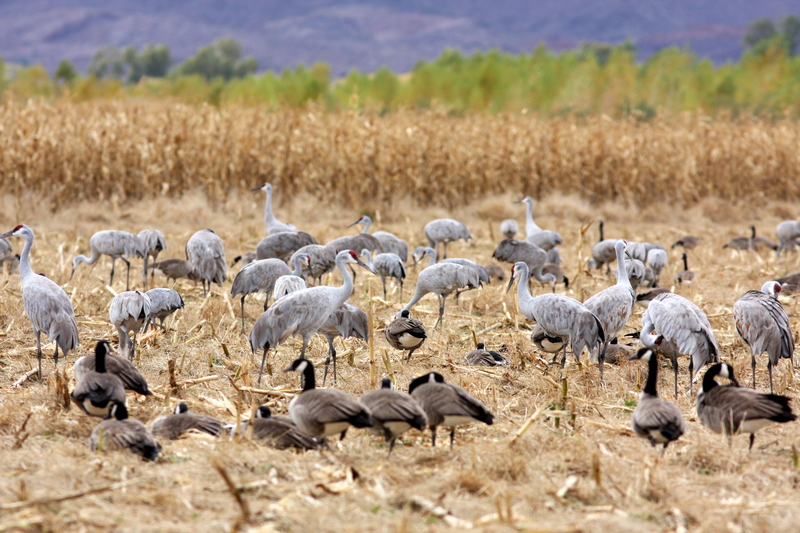 Oh, and no birders live there (not permanently, anyway): the main cities are Parker and Quartzsite. Without the mountain and northern species possible in Mohave, I figure 250 is a solid goal for the year. I checked eBird and the highest year total is 234, my total from last year. I had the thought that it would be fun to start out this Big Year with a January 1 Big Day. Maybe a little crazy: only ten hours of daylight was the main limiting factor, and of course you could do much better in early spring when warblers, flycatchers, vireos, and other migrants have started returning. Still, I figured I could get at least 100 species. I started planning last week: a list of possible species color-coded by difficulty (1-3), a list of locations to visit and a schedule to make sure I can get to all of them by sunset, target birds for each spot. 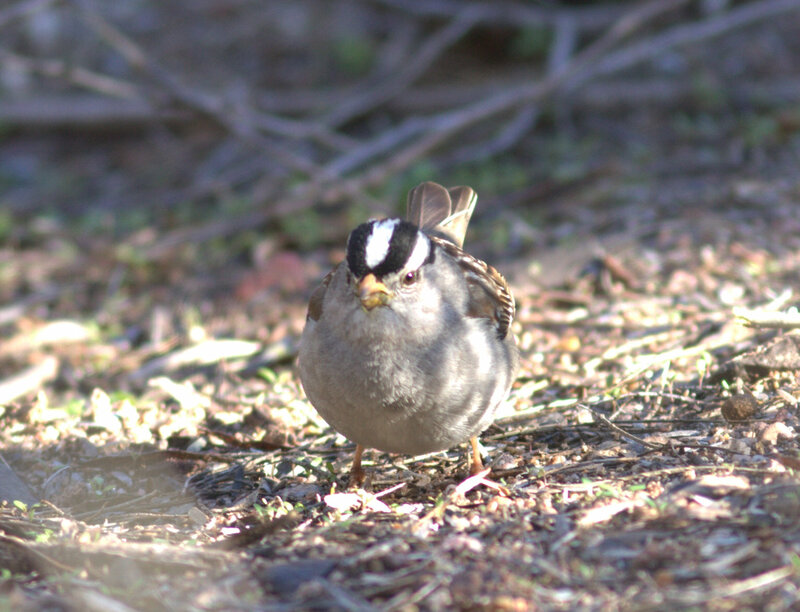 Just a bit of scouting: where can I pick up Hooded Merganser, Rock Wren, Inca Dove? So, New Years Eve, no partying for me: I went to bed around 8:30. Fireworks woke me up at midnight, so I celebrated for a minute before crashing back into bed. Three hours later, I was up and packing the car. I drove maybe a little fast to my first destination, CVCA, and arrived half an hour early. 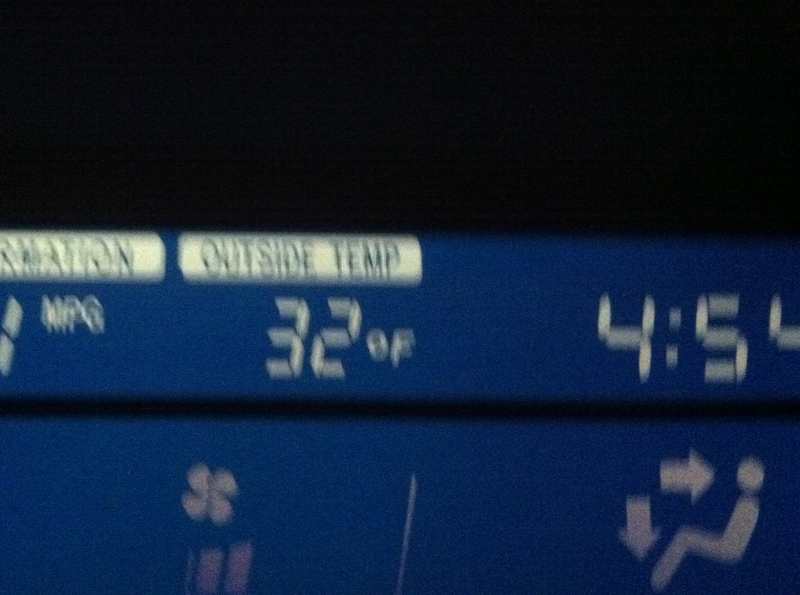 So much for a low of 48. BRRRR! 05:30, only a minute after arriving at CVCA, I heard a mournful “Who’s awake? Me too.” Great Horned Owl: Check. This means it’s the Year of the Great Horned Owl, not a bad first bird! I bundled up as best I could and started walking the perimeter of the plantings under inky black skies peppered with bright stars. Nearby howling dogs and the spooky giant cottonwoods, which don’t allow light to penetrate even in the day, only creeped me out a little. Wailing and yipping coyotes were strangely comforting, as were a few shooting stars. For the next hour and a half, I tried in vain to hear a Barn Owl or Western Screech-Owl. I was certain that if I did hear a Barn Owl scream, I would jump out of my skin. As I approached a canal on the far side of the trees, I could feel the temperature fall below freezing. My sandal-bound toes cursed me, and I cursed the weather forecast. I reached a nice brushy spot around 07:00 and waited for the sun. Ten minutes later, the birds all woke at once: White-crowned Sparrow, Abert’s Towhee, Lincoln’s Sparrow, Hermit Thrush, House Wren. Turkey Vultures stirred in the treetops, a Cooper’s Hawk called. More of the the little guys awoke over the next few minutes, and I started walking out, ticking new species as I went. Audubon’s Warbler, Chipping Sparrow, Gambel’s Quail, Sandhill Crane, American Pipit. I arrived back at the car all ready to move on, but then I noticed that the bushes and trees on the sunny edge next to the car were all twitching with bird activity. New birds were also around the adjacent farm fields: American Kestrel, Killdeer, Mourning Dove. Three little doves flew into the flock: Inca Doves! Not something I was expecting to find. 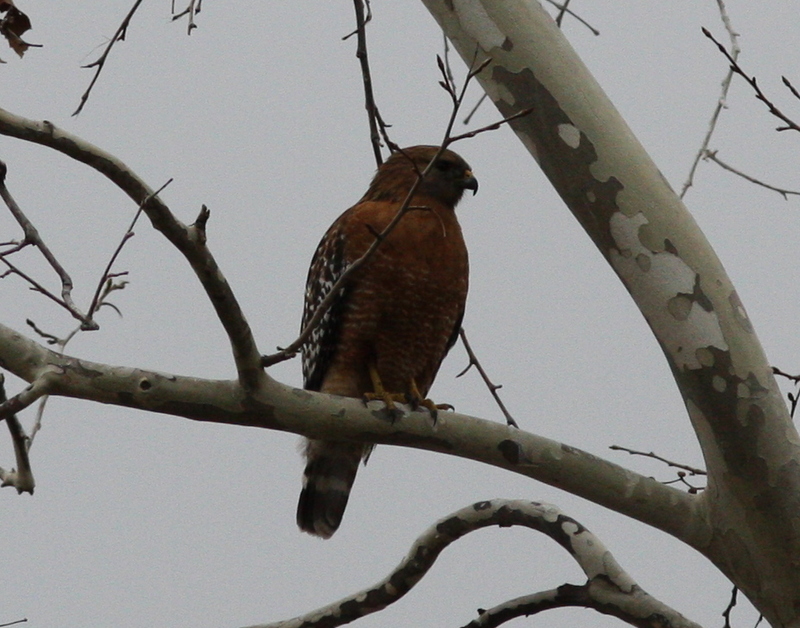 Then I heard a most distinctive hawk call, “kyeer, kyeer, kyeer, kyeer!”, Red-shouldered Hawk! As I turned my head my heart sank as I remembered where I was standing: Imperial County was only about 75 meters north of me. Sure enough, I spotted the source of the call, flying then perching just on the wrong side of the river. Oh well, time to move on: I was late for my next spot. A brief stop at the Cibola NWR headquarters hoping for Common Ground-Dove produced Phainopepla and Anna’s Hummingbird. I started down the loop drive and was delighted to see the pond next to the road was full of birds. I started scanning and ticking: Canada Goose, Mallard, Northern Pintail, Snow Goose, Ross’s Goose, Brewer’s Blackbird, American Wigeon. Out of about 4,000 Canada Geese on this refuge, I wasn’t all that hopeful that I’d be able to relocate the two Cackling Geese that David and I found a few weeks ago. So I was pretty shocked to see three Cackling Geese in the flock! I scanned again looking for a Greater White-fronted Goose, but no luck. Time to move on. I parked at Nature Trail (flushing a Sharp-shinned Hawk as I pulled in) and started a brisk walk around the very birdy loop trail. Birds were dripping from the trees, mostly Orange-crowned Warblers, but a Red-naped Sapsucker and a Spotted Towhee were nice additions. It was a little difficult to hear with all the ducks flying over, heading to and from the resting pond between the plantings. I didn’t spot any new waterfowl on the resting pond, but the edges were graced by Savannah Sparrows and a Vermilion Flycatcher. Continuing around the trail, I heard a loud, full chip coming from a cottonwood that was quivering with Orange-crowned Warbler activity. I recognized it as a Black-throated Gray Warbler, a good find in winter, but I wanted a visual to confirm it. After a minute, I spotted the little gray-and-white bird high in the tree. That species turned out to be my only bird of the day that I didn’t have on my list of likely species! After pulling myself away from the multitude of Orange-crowned Warblers, I jumped in the car and cruised the loop drive. Raptors were cooperative: Red-tailed Hawk, Peregrine Falcon, Northern Harrier. 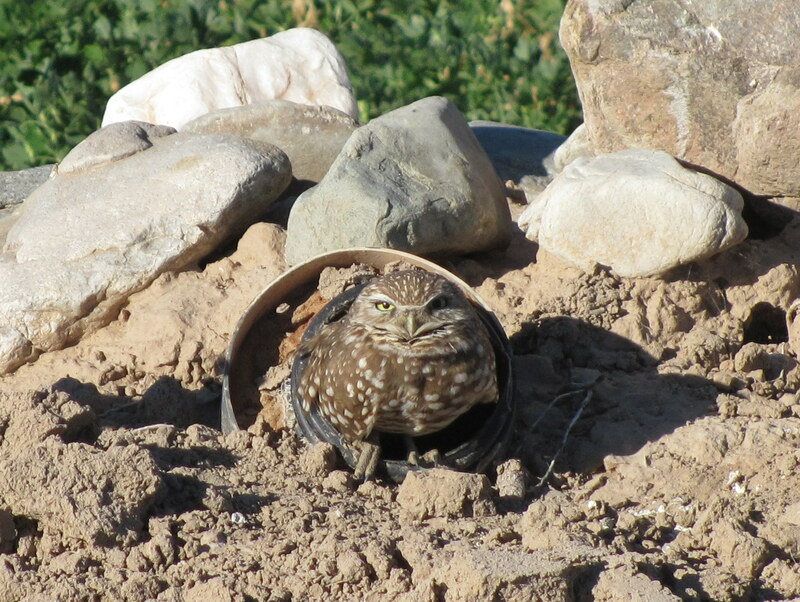 I checked the Burrowing Owl houses as I passed, and after a few empty houses I started to worry that it was still too cold for them to be out. Not to worry, though, as I eventually found a few of the little guys. How could I not take a photo of that face! Normally I could spend all day scanning and counting the thousands of Sandhill Cranes, geese, ducks, and blackbirds of the loop drive. This day, though, I had to move on; I was still half an hour behind schedule! Next stop: Hart Mine Marsh. I was a little disappointed when I arrived: no shorebird habitat. Cattails cover more of the marsh every time I visit, and it was difficult to peek through to the open water, but I still added a good number of new species. Marsh Wren, Double-crested Cormorant, Pied-billed Grebe, Black-crowned Night-Heron, Belted Kingfisher. Redhead and Osprey were good additions to the list, definitely possible to miss. Rails were frustratingly silent, and no Green Herons flew up from the canal on the back side of the marsh. Time to make a decision: go to Cibola Lake, or skip it? It was my only hope for American White Pelican, so I decided to drive there quickly, and I could make up for lost time by not birding the Levee Road. I reached the overlook and was surprised to see more birds on Cibola Lake than I ever have before, although they were mostly Northern Shovelers. No pelican, but Gadwall, Clark’s and Western Grebes (the latter can be difficult), and a few calls from a Common Gallinule. I kept my eyes open as I drove the Levee Road: I knew Greater Roadrunner and Crissal Thrasher would give me trouble today, and this would be a good place for both of them. I was delighted when a little falcon on the side of the road turned out to be a Merlin, the last falcon I needed for the day! 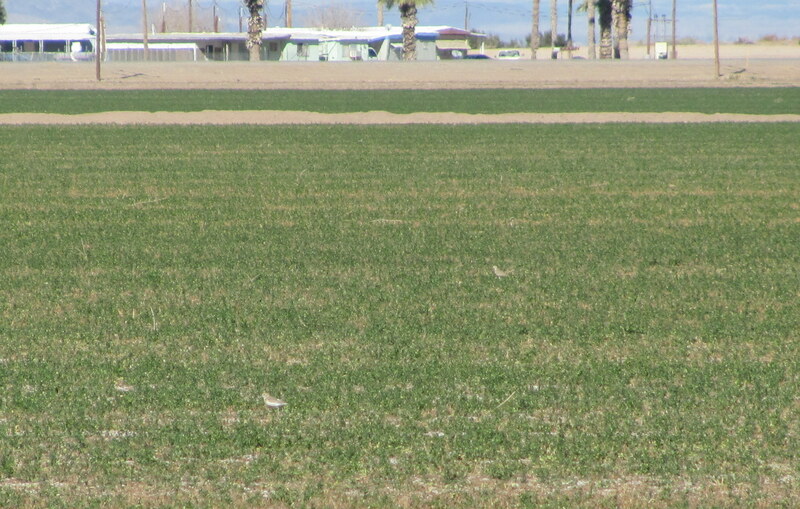 I remained roadrunnerless until I turned onto Baseline Road, when I finally spotted one sunning itself on a dirt mound! With time saved on the Levee Road, I arrived at the pond on Baseline Road 20 minutes early. I thought of skipping this spot – it’s the best place in La Paz County for Wood Duck, but we didn’t find any here a few weeks ago, and there weren’t any other likely additions. But, what the heck, it was on the way. I scanned the pond thoroughly and didn’t see any Wood Ducks, although I did hear my one and only Common Yellowthroat of the day. A few times, though, I thought I heard some quiet wheezing whistles. There must be some Wood Ducks hiding in there. Sure enough, another scan produced two males hiding in a swarm of Mallards. Always a good bird in the LCRV! 11:40, time to head north, and I knew I would have to skip Quartzsite. 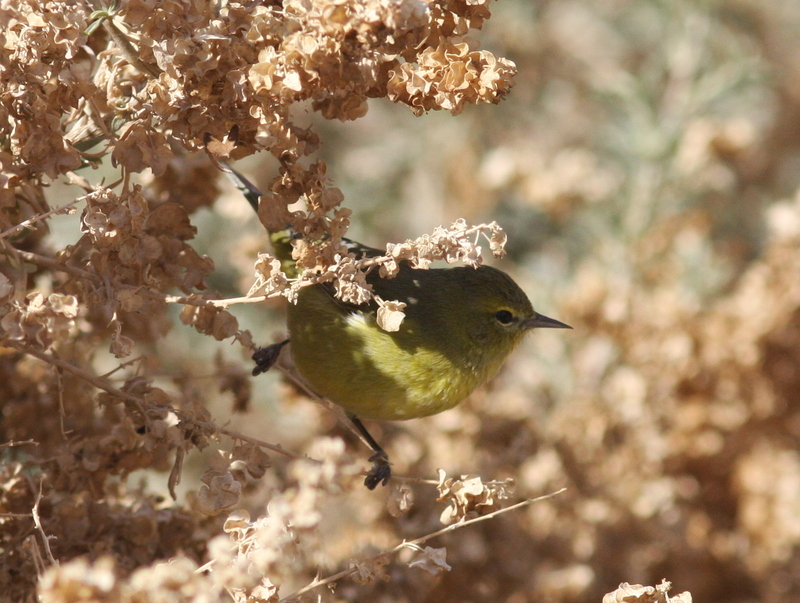 I was giving up my best chance for desert birds like Black-throated Sparrow and Cactus Wren, and the possibility of Harris’s Hawk, but it would give me the time I needed to bird the Parker Valley. I left the Cibola area feeling good at 77 species. The road north heads through Imperial and Riverside Counties in California, and I grumbled at a flock of Brown-headed Cowbirds and a mockingbird, both of which I was still missing for the day. I drove the Parker Valley quickly but stopping frequently, scanning the grassy fields for Long-billed Curlews and Mountain Plovers, and checking for raptors. 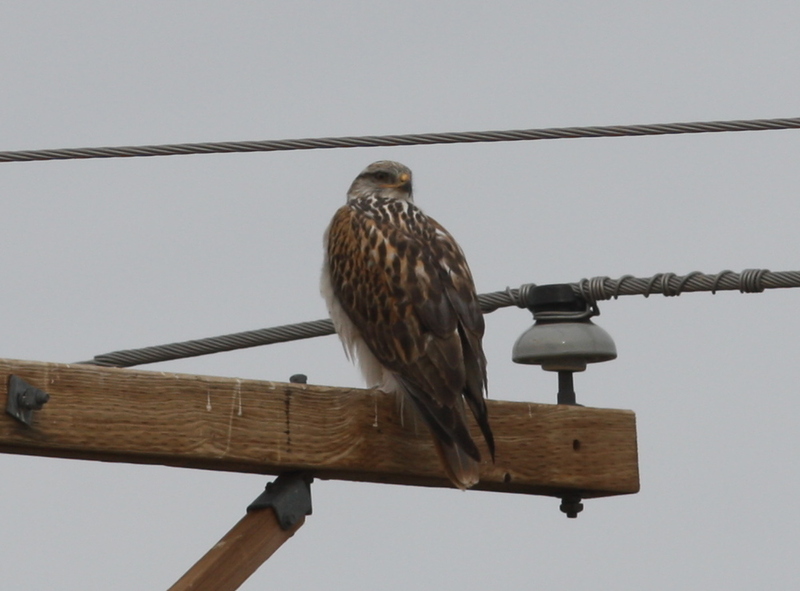 The one small Horned Lark flock I found had no longspurs, but a quick stop to check out a raptor on a pole (Red-tail) turned up very high-flying Ferruginous Hawk and a White-throated Swift. After pulling off at one spot, while waiting for traffic to clear so I could continue, I scanned some grassy fields and spotted two distant ravens, two of only three I had in the day! I decided to turn east of the highway at Tsosie Road. There is a phenomenon in birding that you always want to check a spot that proved productive once, even if it has been utterly boring ever since. Some flooded fields here were once filled with hundreds of Killdeer and a few Dunlin, and I always want to check them now. Almost as soon as I turned off the highway, I glanced into the field to my left and saw it filled with buffy shapes. Mountain Plovers!!! I pulled over quickly and scanned the field: 133 Mountain Plovers. A scarce species that is usually very hard to find, and not one I actually expected to get. 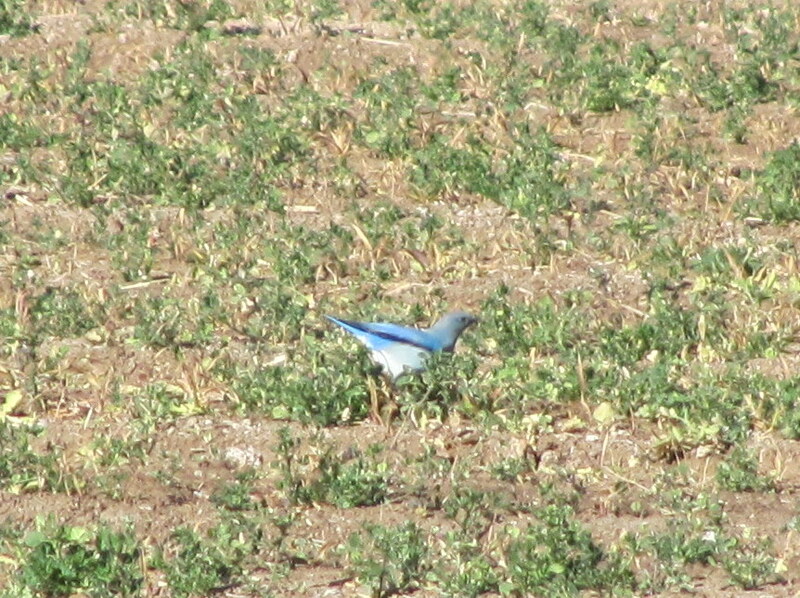 Just as I finished counting the flock, a brilliant piece of blue fluttered down into the field. Mountain Bluebird! Even more difficult to find than the plover. Seeing these two species in the same field was the highlight of my day. Moving on, I checked Tsosie Road on the other side of the highway. A distant flock of blackbirds looked promising, and sure enough, that field produced Brown-headed Cowbird as well as my only Cattle Egrets and Least Sandpipers for the day. I cruised the rest of the valley looking for a flooded field where I could pick up shorebirds: Dunlin, Long-billed Dowitcher, and Greater Yellowlegs. There were none to be found. I stopped at Poston Wetlands and picked up my only Sora of the day. A wet field in Poston had a flock of White-faced Ibis, just as I was starting to worry I would miss that species. I arrived late at ‘Ahakhav Tribal Preserve, but I knew I needed the stop to pick up gnatcatchers and hopefully goldfinches and Crissal Thrasher. I slowly cruised an area that recently had Common Ground-Doves, but no luck. 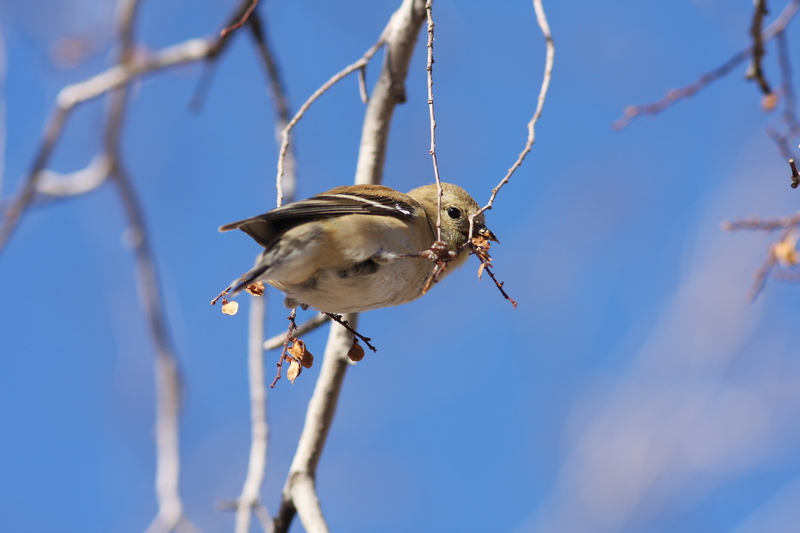 When I parked at the preserve and started listening, I was surprised to hear “potato chip!”, an American Goldfinch, not always an easy bird, and I didn’t even have Lesser Goldfinch for the day! My first Black-tailed Gnatcatcher of the day (!!) called soon after. I walked the park area and added Blue-gray Gnatcatcher. Just before I left I decided to check the small House Finch flock hanging out by the nursery, and discovered a few Lesser Goldfinches among them. No Crissal Thrasher, and still no mockingbird, but time to head up to the Bill Williams. I could skip CRIT HQ (my main target there was American Goldfinch anyway) and Headgate Dam, so that would put me back on schedule. After stopping for gas in Parker (and finally getting a mockingbird, but still missing House Sparrow), I decided to take a gamble and skip Red Hills and Parker Dam. There have been Hooded Mergansers at Red Hills, and Parker Dam is almost guaranteed to have Lesser Scaup. But, I wanted to hurry up and get to the Bill, and both species are possible there. I decided that I couldn’t skip Havasu Springs, my best chance for non-Ring-billed gulls, Common Loon, and Horned Grebe. The usual gull loafing spot only had a few Ring-billed, but I did spot a Common Loon from there. Heading out with the windows down, I finally heard the obnoxious chirping of a flock of House Sparrows. I stopped at a highway pullout above the CAP inlet so that I could scan the ducks there with good light. Common Goldeneye and Greater Scaup were plentiful, but I needed to find Barrow’s Goldeneye and Lesser Scaup. Barrow’s Goldeneyes: no problem, and species #100 for the day! Lesser Scaup took a bit more time, but I finally picked out a sleeping male. Time to move on to the refuge headquarters. It’s not the best spot to scan La Paz County waters, but I needed Costa’s Hummingbird anyway. After a minute I heard that distinctive twittering, and I only spent a few minutes scanning. Tree Swallow, Canvasback, Neotropic Cormorant, Bufflehead. Two male Cinnamon Teal, a nice surprise. An unexpected Spotted Sandpiper working the shore of the CAP inlet. Time to move on. 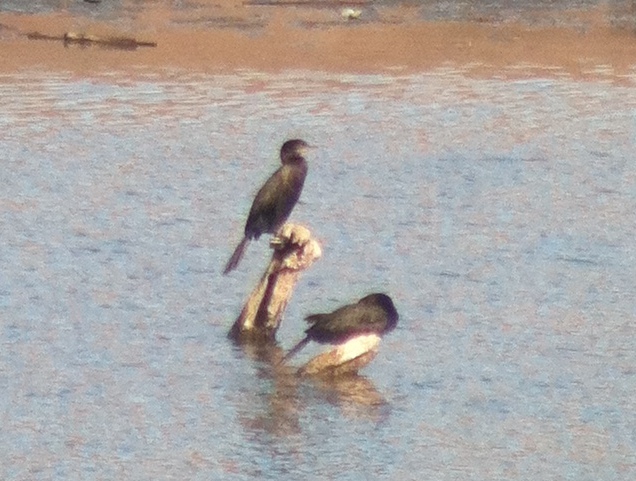 Typical views of Neotropic Cormorants in the Bill Williams. My final stop for the Bill Williams Delta was the overlook close to the bridge, which would give me a much better view of the marshes of the Delta. Just as I laid eyes on my first Eared Grebe of the day, it dove and all the coots around it started scattering. I looked around. No boats. What was freaking the birds out? Then I saw it: a big raptor circling the water. Osprey? No, an adult Bald Eagle! Not always an easy bird in La Paz. It circled lower and lower over the water as a Ring-billed Gull mobbed it relentlessly. As it neared the water, the eagle just reached out and plucked a fish from the water. Wow! Now that I had almost all the expected ducks, I became very aware that I didn’t have a single merganser for the day. 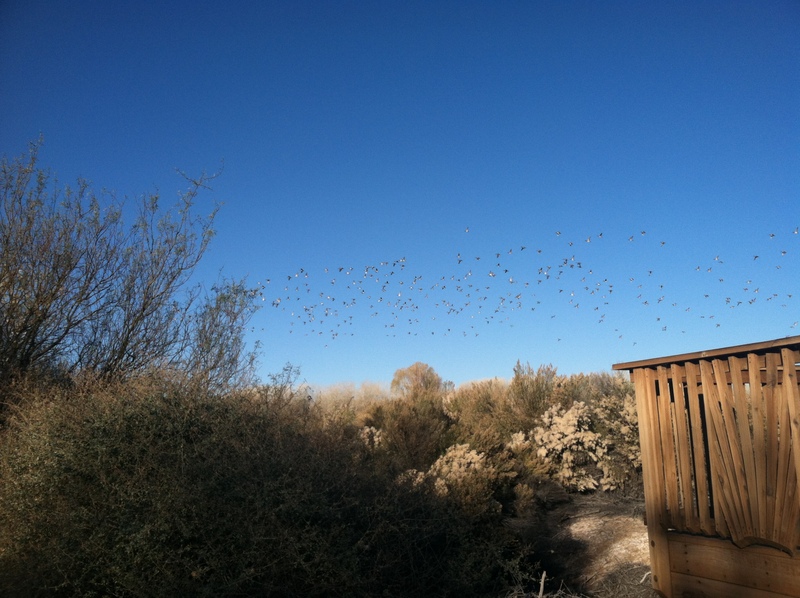 I eyed the roosting flock of Common Mergansers on an island well into Mohave County. As if on cue, two of the birds took off and started wheeling around, headed for La Paz! 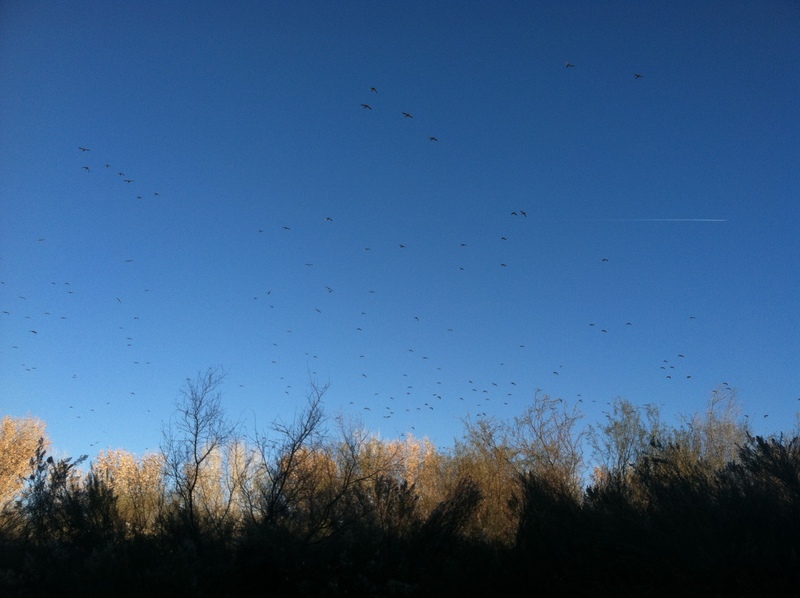 …the excitement only lasted a minute, as the jerks with wings disappeared behind a reed island well into Mohave. Even though I knew I needed to move on and get to Mosquito Flats, I was reluctant to give up on the mergansers. All three species should be here! 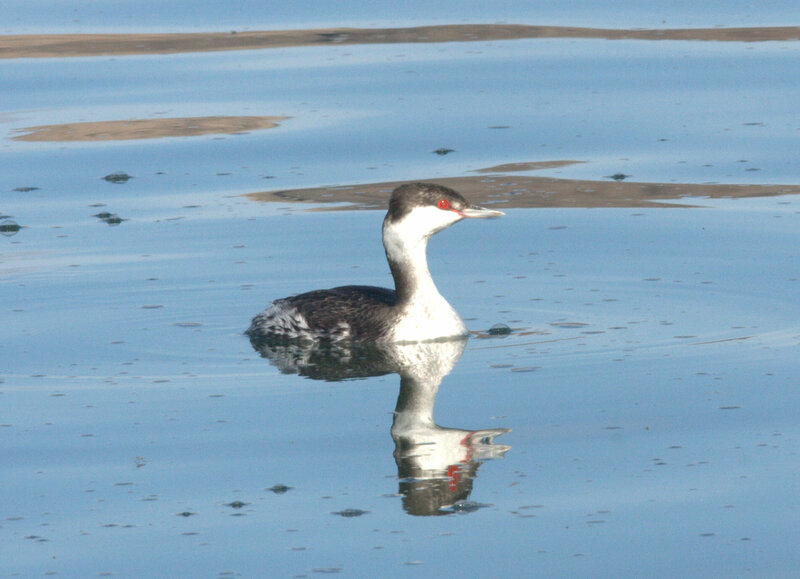 I scanned the edge of the CAP peninsula, a spot I couldn’t see from the headquarters, and picked up a Horned Grebe. I scanned the marshes and rocky edges again and again. While I happened to be looking at a little marshy corner, a small heron flew into sight. My first thought was that it was a Green Heron, which I had been looking for all day. But it landed and showed its buffy body plumage and black back: a Least Bittern, very scarce in winter! Finally I figured the Bill had taken good care of me, and it was time to move on. It was quiet when I arrived at Mosquito Flats, and the sun was already hidden behind the Buckskin Mountains. I paced the road around the usual haunts of the Nutting’s Flycatcher, and strained my ears listening for new species. Canyon Wren was most obliging, even setting off a bit of a cacophony at dusk. In the silence I started to worry that I might miss Gila Woodpecker, unacceptable!, but twice I heard distant calls and breathed a sigh of relief. Crissal Thrashers, too, finally announced themselves with their distinctive “doity doity”. The light faded and the Nutting’s remained silent, as it usually does in the evening. No Rock Wrens called. I spotted a silent lump moving through the catsclaw next to my car, and was surprised to see one of the Cactus Wrens that has been around: not a species I expected to find. Getting Cactus but not Rock was a bit backwards, but okay. I realized that was #117 and started to think of what three species I could still get. It seemed less and less likely as the light faded, and I finally gave up on Passerines for the day. I hoped for rails in the forest, until I remembered that the beaver pond was probably dry. Once it seemed dark enough for owls, I tried again for Western Screech-Owl. Mosquito Flats has a very high density, so I was hopeful. Finally I heard a sound which at first I thought was a distant singing Pied-billed Grebe. As I listened I realized it was coming from fairly close, and no, that was definitely an owl. Check! I looked up the vocalization, the bark call, which is an aggressive response to predators and sometimes other owls. It sounded something like this, but this bird was giving a much longer series which recalled a Pied-billed Grebe. I gave Virginia and Clapper Rails one more try at the Bill Williams bridge, but the marsh was stubbornly silent. Anyway, it seemed fitting to start and end the day with owls. 118 was a better total than expected, and a very fun day! I ended up with 71/72 Easy species (Common Merganser being the biggest miss), 41/67 Medium species, and 5/29 Hard species, plus Black-throated Gray Warbler which wasn’t on my list. La Paz County, shown in the blue-green outlines. Plenty more to see this year! 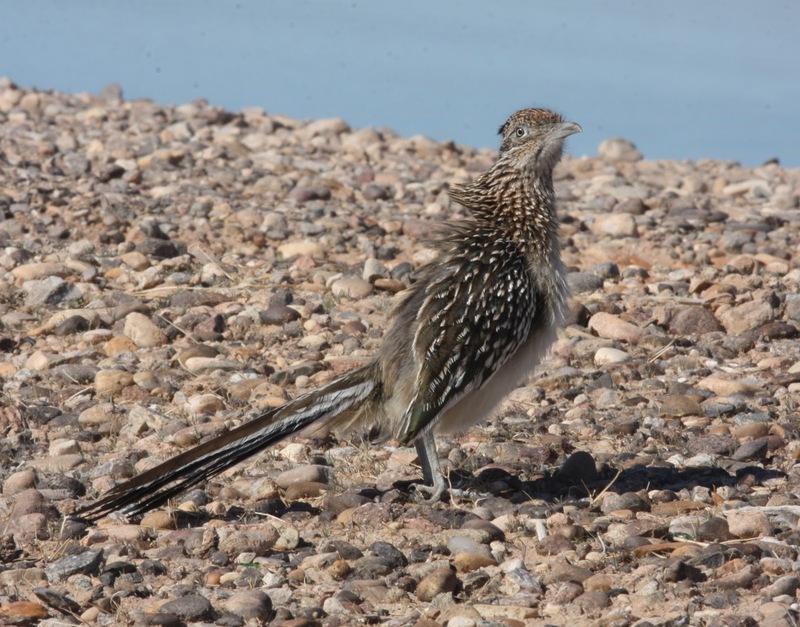 This entry was posted in Big Year, Bill Williams, Cibola NWR, Imperial County, La Paz County, LCRV, Trip reports, Vagrants and tagged Arizona Birding, Big Day, Big Year, County Big Year. Bookmark the permalink. Hey great start on your endeavor Lauren! You came away with a bunch of really nice photos too by the looks of it. Good luck in 20914; looking forward to your updates! Thanks Laurence! I kind of cheated on the photos, the only photos that are actually from yesterday are the Burrowing Owl (I do like that one), the Mountain Plovers and bluebird, and the big flocks of ducks flying over. 😉 My New Years resolution is to post more, so hopefully there will be some updates!! Nicely written blog, Lauren! You had me at the edge of my seat, especially at the part about IDing the Western Screech Owl. I had no idea it made that sound. Sorry you didn’t get Rock Wren or Common Merganser. That just means you’ll have to do another Big Day next year. Ha! No, I didn’t notice that. But now I’ll have that song stuck in my head for the rest of the day. I thoroughly enjoyed reading this summary–am a lover of Big Days, do two a year myself. I grew up in Tucson, left thirty years ago, live in Massachusetts now. 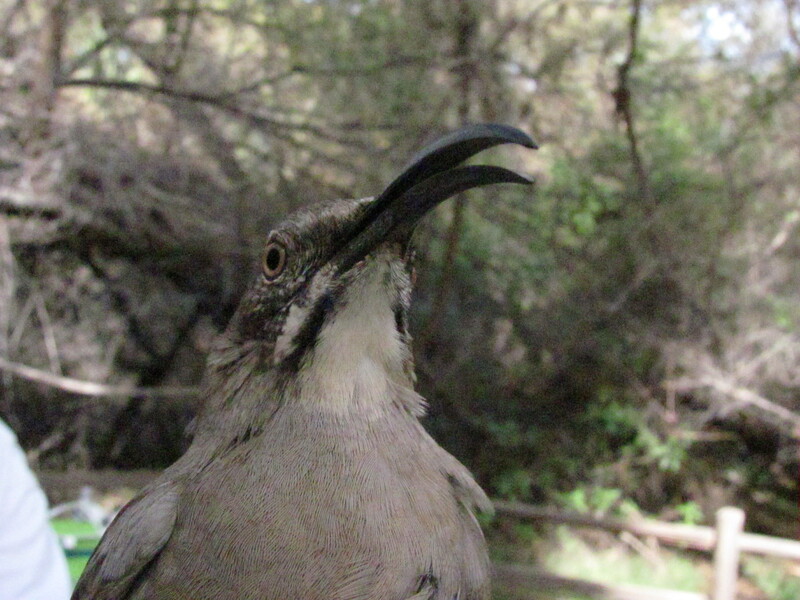 When I was living in AZ there was hardly any appreciation that your part of the state had any good birds–Bill Williams was just being discovered when I left, and I hadn’t even heard of some of the sites. Super how many species you found which I saw only once or twice in the years I lived there (Ross’s Goose, Barrow’s, Least Bittern, Mountain Plover, Common Loon just to name a few, or not at all–Nutting’s, Blue-footed Booby). Also very cool how many species you found with one observer–we just did the Super Bowl of Birding here in MA, had 84 species in a similar 5 a.m.-5 p.m. thing, with 4 people in an area which has tremendous coverage and lots of eBird presence–best birds were Shoveler, Red-headed Woodpecker, Rusty Blackbird, and all but Rusties were found with help of others. Made me very itchy to get to check out the Colorado River Valley! Thanks David! This really is a cool area, and there’s still a lot left to be discovered!